It would have been funny, if it was not that dead serious, and the placement of the right hand is worrisome. Guns are not quite silent in the devastated Donbass, and Putin’s order to withdraw troops from the border area is no different from his several prior zigzags in manipulating this conflict, so that no real redeployments are taking place. What is happening in this pause, is the new spike in Russian military activities in the Arctic. A new system of strategic monitoring is under development, naval and air exercises are conducted non-stop, and work on constructing new bases (mostly in the place of long-abandoned garrisons) is given top priority. Plans for deploying squadrons of tactical aviation in these bases might make some strategic sense, but the intention to build a new army brigade in the Yamal peninsular (where Gazprom has a no small corporate army) is mind-boggling. There is no possible tasks for such a grouping in the High North, which in the recent Russian discourse was defined as “territory of dialogue” or “zone of peace and cooperation”. A very different discourse is now prevalent, and Nikolai Patrushev, the secretary of the Security Council and one of Putin’s reliable lieutenants, took it to a new level of anti-Western hostility in a recent interview. He did not mention the Arctic specifically (though this is one of his pet topics) but his point that Ukraine was just a pretext and an instrument for executing the US plan for reviving the strategy of containment centered on Russia is informative, as is his reference (yet again) to the alleged statement by Madeleine Albright on Russia’s inability to develop the territories and resources under its control (this fake was disproved many times). In this context, the commitment to address the environmental problems in Russian Arctic looks dubious, but the plans for greater use of nuclear power are worrisome indeed. 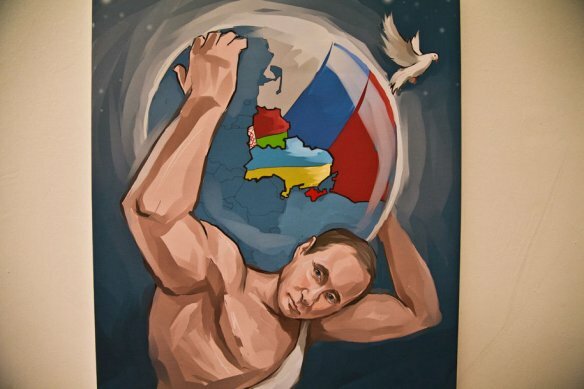 This picture may look like a political cartoon, but it is in fact a part of the exhibition in Moscow marking Putin’s birthday, and the grasp on the Arctic by his right hand appears rigid, even if the plans for submitting the long-promised claim to the UN Commission on the Limits of the Continental Shelf (UN CLCS) is apparently again postponed.